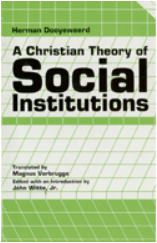 Book: A Christian Theory of Social Institutions - John Witte, Jr.
An English translation of Dutch jurist and philosopher Herman Dooyeweerd’s lectures on social theory at the Free University of Amsterdam in 1937, and a sturdy philosophical defense of the neo-Calvinist idea of sphere sovereignty introduced in the prior generation by Abraham Kuyper. The volume further provides a pithy introduction to Dooyeweerd’s more complex theories of law, politics, and society set out in later books like his Encyclopedia of Legal Science, A New Critique of Theoretical Thought, and Reformation and Scholasticism. A long editorial introduction situates this work within Dooyeweerd’s system of thought. Introduction by John Witte, Jr.